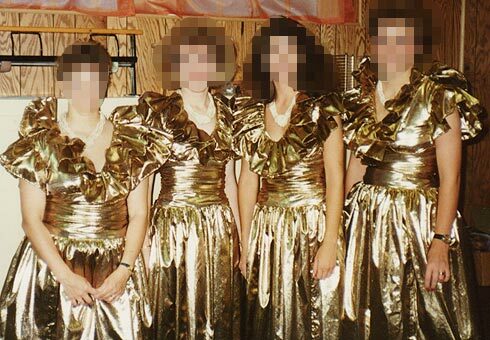 We all the know how the joke about bridesmaids goes - they're always dressed alike in horrifying colors and dress styles that are reminiscent of a prom night fashion nightmare. After the wedding, the bridesmaid dress is stuffed into the back of the wardrobe, never to be worn again. I suppose the idea is that the bride is supposed to be the one to shine; it's her day to be noticed. So bridesmaids are not expected to turn heads, hence the requirement that her attendants (bridesmaids) are dressed in drab clothes. But that's just old thinking - would you want the below at your wedding? 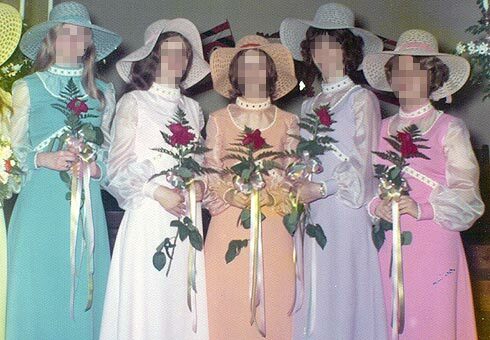 Take a look at the fashion statements below, and see what that says about the bride who allowed it at her wedding! Given the great many stylish bridesmaids dresses available today, and at great price tags too, there is really no reason to make a fashion mistake. Basically, you should continue to do what you are doing right now. Surfing the web, viewing designs, and narrowing down complementary colors that fit in with your overall wedding theme. Check out the latest styles online first - places like Anntaylor.com has a great selection of elegant bridesmaids dresses that can provide you with inspiration on designing your own bridesmaids dress (even if you choose not to purchase from them). Make an date with a few of your bridesmaid and hit the stores. This part is necessary so that you get a sense of the style your bridesmaids like. Once you narrow down their likes and dislikes, you can then get input from your other bridesmaids. While the choice of the bridesmaids' dresses are up to the bride, it is helpful to have a second opinion, especially from someone who will be wearing the dress! Once you have gathered all the information you need, have a color and dress style in mind, then it's time to make an appointments with the bridal shops and department stores. Call ahead to find out if an appointment is needed so you do not add to your stress level when you arrive only to find out they cannot see you for bridesmaid dress consulting. If you are tailoring your dresses, then be sure to bring in pictures of the style you want, so that the tailor can visualize the style you have in mind. 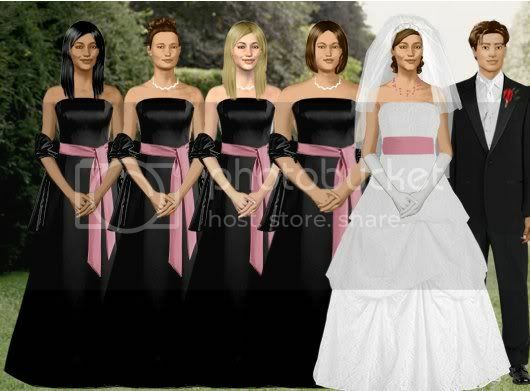 Be sure to have all of the bridesmaids professionally measured for their bridesmaid dresses. You can often do this at your first bridal shop or department store. This way you can cross reference them with the size chart for the manufacturer you have selected in order to ensure you order the size that is closest to their figure. 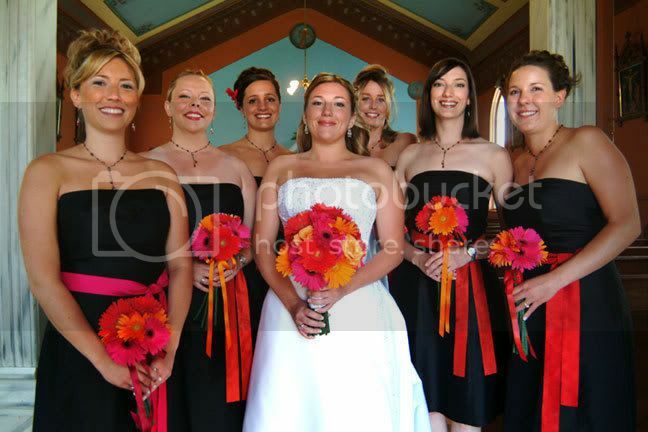 Many bridesmaid dress designers make their dresses with the measurements of their own size chart and not to each individual. As a result, you should not assume that a size 8 from manufacturer "A" will fit the same way a size 8 does from manufacturer "B". 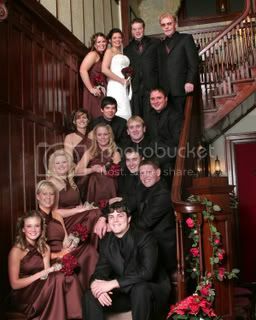 Of course, it is the bride's privilege to select the color and type of fabric of the bridesmaids' dresses. 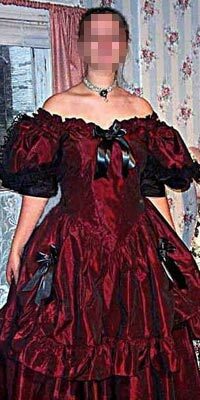 And yes, it should definitely be complementary to the bride's weddign gown, but it should also be comfortable and attractive for the bridesmaids. Keep in mind your bridesmaids' body type, their skin tone, their style preferences - then find something that does not clash with them. You do not want an unhappy bridesmaid at your wedding. By taking into account their considerations, you can be sure of keeping them happy; an act they're sure to appreciate. 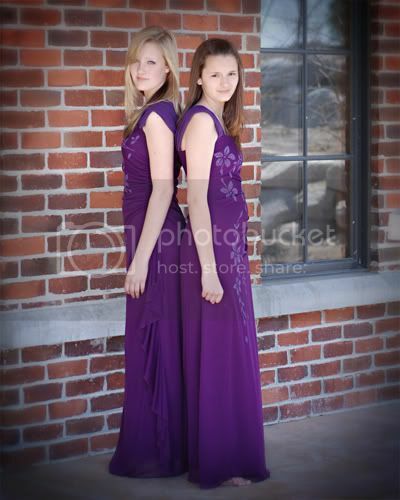 Once you order your dresses, be sure to set up an appointment for alterations for your bridesmaid dresses. Since most dresses will need some degree of alterations, you should allow plenty of time for 2 fitting appointments. Bridal attendants should bring shoes with the correct heel size to the fittings, as well as appropriate hosiery and slips. Once the bridesmaid dresses have been selected, shoes, gloves, shawls, sashes, purses and hair pins or combs should also be decided.